What Day Of The Week Is October 29? 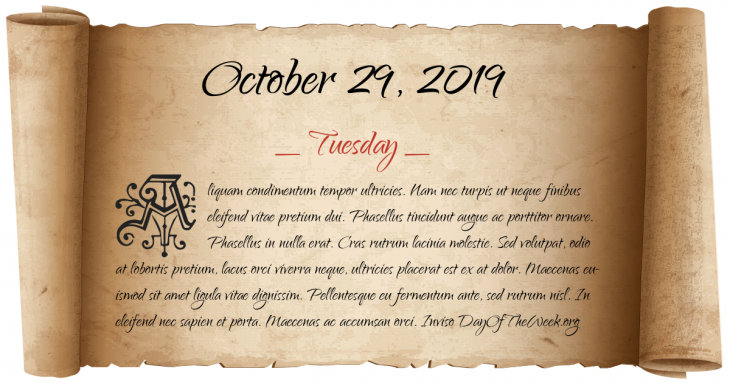 October 29, 2019 is the 302nd day of the year 2019 in the Gregorian calendar. There are 63 days remaining until the end of the year. The day of the week is Tuesday. Cyrus the Great enters the city of Babylon, detains Nabonidus and ends the Babylonian captivity. He gives the Jews permission to return to Yehud province and to rebuild the Temple; but most Jews choose to remain in Babylon. American Civil War: Battle of Wauhatchie – Forces under Union General Ulysses S. Grant repel a Confederate attack led by General James Longstreet. Union forces thus open a supply line into Chattanooga, Tennessee. Getulio Vargas, president of Brazil, resigns. Suez Crisis begins: Israeli forces invade the Sinai Peninsula and push Egyptian forces back toward the Suez Canal. Montreal’s World Fair, Expo 67, closes with over 50 million visitors. Who were born on October 29?